As enterprises are getting modernized with digital transformation, IT has moved away from static or monolithic infrastructure to continuous delivery models, involving dynamic environments that span across multiple clouds. 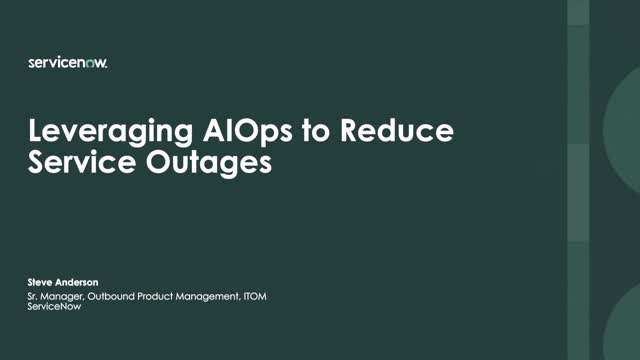 Learn how AIOPS is evolving the IT Operations role from reactive (firefighting) mode to proactive remediation. Companies don’t often measure their software usage or have visibility into what is deployed against what has been procured. This challenge can lead to risks such as unknown compliance audits, excessive spending, and manual work. Companies can incur revenue loss in millions of dollars due to unknown software license costs. ServiceNow is the only platform that runs Software Asset Management (SAM) natively in the same place you manage IT. With ServiceNow SAM and IT Operations Management (ITOM), companies can now have complete visibility of IT infrastructure as well as software usage and license costs. Wayfair has an extremely mature and well-defined DevOps culture in which the company was built on; and this introduced challenges on how to enable ServiceNow as the core platform for their production operations. Learning how to integrate multiple ServiceNow modules into the CI/CD pipeline and aggregate operations with deployments was key to getting a holistic view of how business services are performing. Having a single hub for all of the data allowed Wayfair to build KPI’s that are much more relevant to a DevOps world—focused around agility and failing fast. Participate in this session to learn how you can get support for all phases of your DevOps process lifecycle. Organizations are recognizing that adopting a service-oriented operating model, underpinned by system-based automation, can address many of the core challenges of competing in a digital economy. At the same time, defining value-based outcomes in the form of products and services, and optimizing shared processes with automation, have been proven to increase productivity, foster collaboration, lower costs and improve speed, no matter the business department or function. The sum of these capabilities and outcomes are often referred to as Enterprise Service Management. Join Troy DuMoulin from Pink Elephant and Bruce Randall from ServiceNow as they provide an overview of the many dimensions of Enterprise Service Management. IT is the engine that delivers service reliability and agility for your business. Watch this webinar to see how ServiceNow practices what we preach. By bringing together the power of IT Operations Management (ITOM) with IT Service Management (ITSM), ServiceNow proactively identifies issues, eliminates service outages and accelerates time-to-resolution. By automating IT operations, we transformed our Network Operations Center (NOC) into a service reliability team that can quickly and accurately respond to the needs of the business. Hear best practices from Joe Corpion, Director of IT Operations, and Michael Prouty, Senior Manager of IT Operations on how to combine the power of ITOM + ITSM. Digital transformation means transforming IT. Whether increasing productivity, driving insights, delivering innovation, or simply providing a consumer-like experience for employees, IT has proven to be an indispensable element in your business success. Join Darren Hamway, Portfolio Manager/IT Project Management Office, Tiffany & Co., and Bruce Randall, Director Product Marketing, ServiceNow to learn how to deliver innovation without negative employee impact, or breaking the bank on infrastructure and resources. Curious how using Spotlight and Word Clouds can make work better all the time? Join ServiceNow experts – Satish Mallavolu, Senior Manager, Business Intelligence, and Vivek Ambekar, Senior IT Business Intelligence Analyst – as they discuss how Performance Analytics can transform your IT experience. At ServiceNow, we use our own IT Service Management solution, coupled with Performance Analytics. A critical element in our journey is the ability to continually improve operations by setting clear goals and measuring Key Performance Indicators (KPIs) against our goals. Performance Analytics offers unique capabilities and advantages in providing actionable insight and real-time trends of KPI performance. It also enables persona-based views of the information to all stakeholders in our organization – from our operations staff to our CIO. Most IT folks who live in the Ops world exist in a heads-down environment where they care a whole lot about what’s happening right now. However, it’s also important to have visibility on financial or compliance impacts to the business. Configuration Management is great for the here and now but it takes real IT Asset Management (ITAM) to harness the full SDLC (software development life cycle). Join George Spalding, EVP, Pink Elephant and Eric Ferrington, Product Manager, ServiceNow as they discuss the relationship of Asset Management and Configuration Management. Imagine what’s possible when you run ITAM from the same place you configure IT. Join this webinar to learn how you can enable end-to-end software life cycle management from a true single platform to optimize software spend and reduce license compliance risk. You will hear from Softline, a ServiceNow SAM partner, about the critical functions and processes that can make your SAM program successful. See a demo of how embedding SAM into everyday IT management such as IT infrastructure changes and Application Portfolio Management are industry game changers. Imagine what’s possible when you run SAM from the same place you manage IT. Join Troy DuMoulin, VP of R&D at Pink Elephant, and Thom Gray, Senior Staff Product Manager at ServiceNow, as they discuss how to close the gap between enterprise strategy and team-based backlogs using integrated planning processes, key stakeholder roles, and visual management tools. Learning visual management tools such as Kanban boards, Shared Backlog, and Big Room Planning for easier collaboration. In this webinar, you’ll learn about optimizing your business while starting to shape the future. Discover firsthand how ServiceNow® Software Asset Management (SAM) and Discovery helps clients reduce software spend with automated detection, consolidation and reclamation of Software Assets. Register now to see for yourself how SAM uses a single system of action that helps seamlessly transform operations from reactive software asset management practices to a proactive culture that is audit ready and optimizes license spend. Expedia Group is the world’s travel platform, instantly connecting travelers to hotels, vacation and car rentals, airlines, and unique activities around the globe. And this multi-channel, multi-platform global marketplace has no time for downtime—which is why it was critical to understand the state of their data center at all times. Join Senior IT Service Management Lead at Expedia Group Stephen Phayre as he shares his experience using infrastructure monitoring for improved Discovery troubleshooting and building a “self-healing” CMDB. The Expedia Group IT Team has successfully delivered a single system of record across IT, using Discovery and monitoring to identify system outages, expedite service failures to IT, route work to the right team members, and provide insight to IT leaders. ServiceNow Performance Analytics brings the power of data to stakeholders and subject matter experts at all levels of your business – delivering actionable insights where they can make the most impact. It can help your organization make better decisions, improve business services, and help align with your organization’s goals. But how do you get started on this journey? How can you optimize business processes and deliver outcomes, such as 10% reduction in IT spend? We will provide you with the resources you need to get started with Performance Analytics and drive adoption within your organization. Like many organizations, ServiceNow began its employee onboarding journey with a myriad of custom and point HR solutions that resulted in broken cross-departmental processes, lack of personalization, frustrating upgrades, and an inflexible model that could no longer scale. For us to create the workplace of the future we needed to go on our own HR Transformation journey and re-design the New Hire Onboarding experience to support our rapid growth and today’s consumer-driven workforce. In this webinar, you’ll learn how we’re “drinking our own champagne” by successfully replacing our legacy onboarding application with ServiceNow’s out-of-the-box Enterprise Onboarding and Transitions solution. Discover how ServiceNow is building the workplace of the future by making it easy for employees to get the services they need. Discover why the employee experience is shaping up to be one of the most top-of-mind topics for HR leaders this year. We brought together industry experts Pat Wadors, Chief Talent Officer at ServiceNow, and Jason Averbook, CEO & Co-founder of Leapgen, to discuss why the digital employee experience matters so much and what the future of work looks like for forward-thinking organizations. Your enterprise needs to move faster, but lack of process and legacy tools hold you back. Every day, thousands of customer requests, IT incidents, and HR cases follow their own paths—moving back and forth between people, machines, and departments. Unstructured. Undocumented. Unimproved for years. With the ServiceNow System of Action you can replace these unstructured work patterns of the past with intelligent workflows of the future. Now every employee, customer, and machine can make requests on a single cloud platform. Every department working on these requests can assign and prioritize, collaborate, get down to root cause issues, gain real-time insights, and drive to action. Your employees are energized, your service levels improve, and you realize game-changing economics. Work at Lightspeed.